Brian Lomax never played for a football club, never managed a football club and certainly never owned a football club - not personally, anyway. He was a football man who rarely used the words 'I' or 'me' in relation to the sport he loved and only ever wanted to enrich, but his quiet and understated influence on the British game is undeniable. And following his death earlier this week, his legacy - often a loaded and overused term in sport - has rarely seemed as relevant. "If Massimo Cellino changes his mind and decides not to sell Leeds United to the fans it will not be because the idea is mad - that is Brian's legacy," said former Supporters Direct chief executive Dave Boyle on Tuesday, the day before the mercurial Italian did just that. 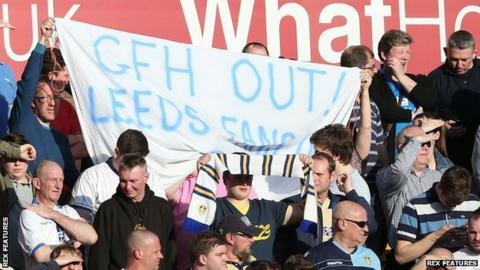 It is telling that it is Leeds Fans United (LFU), the group of supporters who combined to buy either a minority or majority stake in their beleaguered club, that look like the sensible businessmen today and not the man who promised to sell to them on Friday only to change his mind on Wednesday. That the superstitious, self-styled "new sheriff in town" has done so whilst accusing LFU of "telling fairytales" and "talking too much" is indicative of the sticky mess left behind by many of football's sugar daddies, something Lomax spent 20 years of his life wading through. Set up in 2000, Supporters Direct helps fans to gain a proper say in the running of their clubs, and sometimes even take control of them via democratic co-operatives called supporters' trusts. Lomax was an obvious choice to be its first champion as he had effectively invented the idea when he galvanised a group of fellow Northampton Town fans to rescue the club in 1992. "The concept of fan-ownership in British football was something you had to invent because we just had no tradition of it," explained Colin Farmery, a spokesman for Portsmouth, the biggest club to have been saved from financial ruin by its fans so far. "So we needed a blueprint. Brian did that. He got the ball rolling." It sounds ridiculous now but the idea that fans could run things better than many of the owners we have seen in football over the years really was revolutionary stuff, which is ironic for a Liberal Democrat councillor who studied theology at Cambridge. But there was a whiff of revolution about what Lomax did at the Cobblers, a club in existential crisis then as they are again now, a depressing state of affairs I will return to. Back then, fans' groups were either of the sheepishly loyal, uncomplaining, official supporters' club variety, or wild-eyed anarchists selling "sack the board" fanzine specials in pubs outside the ground. Lomax fused these strands and made something more coherent and constructive. It was also, as he put it, "inescapably political". No longer would the pound coins thrown in buckets by loyal fans on Saturday afternoons just be handed over to so-called experts on the board to settle whichever unpaid bill was most pressing while they engineered an exit, which was often the unsavoury game of finding another rich person or writing off debts to local businesses and the public purse via administration. The Lomax rescue plan came with strings: our money for a stake in the club and a seat on the board. Oh, and an immediate change of regime. That plan won in the end, and Northampton Town was spared the fate that befell Aldershot and Maidstone United that year - the last two Football League clubs to be liquidated. Lomax would go on to spend seven years as a Cobblers director. Variants of this plan would be repeated many times over the next decade, often with Lomax's direct intervention, and his role in the salvation of numerous cherished clubs, each of them a source of local pride, is evident from the messages of condolence posted this week. "It is no exaggeration to say that without the experience, knowledge and support of Brian there would be no Enfield Town," says the website of English football's first trust-led "phoenix club". "He is one of the very few people that you could say 'without whom…'" is the epitaph on the website of FC United of Manchester, a club founded on the purest of co-operative foundations. "He made an enormous contribution to furthering the cause of football fans on many fronts. He will be sorely missed," said Matthew Breach, the chairman of the Dons Trust, owners of the club that emerged from one of English football's most obvious examples of fans being ignored by club directors, AFC Wimbledon. Nowhere will Lomax, who was given an OBE in 2009, be more missed than at Northampton Town. Twenty-three years after the Northampton Town Supporters' Trust first rode to the rescue, it is saddling up again with the club facing a winding-up petition in London on 16 November over £166,600 in unpaid taxes. As so often in these situations, the taxman is an innocent bystander in an ugly fight over a property play, in Northampton Town's case the redevelopment of their Sixfields home with the real prize being a hotel, conference centre and housing project on adjoining land. Revenue & Customs' debt is relatively minor compared to the £10.25m in outstanding loans given to the Cobblers' departing owner David Cardoza by Northampton Borough Council for that emphatically unfinished work. It almost goes without saying that the players and staff have not been paid either. "It is such a shame that we are back in this position after all of Brian's work," the trust's spokesman James Averill told me. "He will always be an inspiration to us and we are just going to have to do it all over again." The club's plight was a source of great unhappiness to Lomax during his final weeks, particularly as he was not strong enough to help personally. His daughter Emily, however, did give a rousing speech on the pitch before a recent home game. Leeds Fans United could use his steely determination too, now Cellino has pulled up the drawbridge. But the team assembled by LFU chief executive Dylan Thwaites appear to have learned many of Lomax's lessons. They have been conciliatory but not supine in their relations with the current ownership. They have already secured one very practical win for fans in talking Cellino down from his rash threat to limit away ticket allocations because of his annoyance at how often the club's games are televised. And they represent a broad spectrum of the fanbase, which has given them cheap access to lots of white-collar expertise. They are no mugs. Their plan to combine one man, one vote community shares with larger stakes and interest-free bonds from richer fans makes financial sense. They are also talking about using old-fashioned bank debt, secured on sensible terms, to cover any gremlins in the accounts, underwrite any proof of funds required and hopefully do what should have been done long ago - recouple Leeds United with its ground. That deal is waiting to be done for no more than £20m but Cellino has either been unable or unwilling to do it. A strange state of affairs when you consider the annual rent at Elland Road is £2m. The LFU approach is not that dissimilar to that of the Pompey Supporters' Trust in 2013. Lomax would be impressed. Sadly, however, they are dealing with one of British football's most bizarre proprietors and the amount of money required to re-float Leeds United is way beyond what can be collected in buckets. A source close to the negotiations about the club's future has told me Cellino "wants all his money back", which amounts to about £37m. And for that they would get about 84% of the club, as he has managed to dilute the shareholding of the previous owners, Bahraini bank GFH, to about 16%. The source said there are at least three overseas groups interested in Cellino's shares, and it is understood there is also a British-based consortium following developments. He did not need to spell out that Cellino's flirtation with fan-ownership was a convenient way to bring those parties to the table. None of this would have come as much of a surprise to Lomax, who saw these tactics and many more in his efforts to save the likes of Chesterfield, Exeter City, Lincoln City, Stockport County, Swansea City et al. But those clubs were saved by their fans in the end, because ultimately they were the only ones left with the stomach for the fight. "Brian was probably the first to talk about fans being the moral shareholders of their clubs - that clubs are the fans," said Boyle, who learned so much from Lomax. "OK, the sums involved now make fan-ownership practically difficult at many clubs, but he proved it is possible."